As the June primaries for our statewide races get closer, there is a lot of media attention and stories written about the power being wielded by special interests, PACs and big money. They focus on the large amount of cash and influence being bet on the horses for governor and the legislature. The Business Council of Alabama and ALFA are getting prepared to protect their friends and allies and punish their enemies. These two powerful and money laden special interests will be players in the 2018 horse races. Surprisingly, these two pro-business organizations are not riding the same horses in a good many races, especially statewide. Quietly behind the scenes is another power in Alabama politics, Milton McGregor. You can bet he is playing ball. McGregor’s influence is felt in decision making races in the state from governor to every legislative race. McGregor is the E.F. Hutton of Alabama politics. When he speaks people listen, and more importantly when he speaks politicians listen. He also transcends party. He supports people who are his friends regardless of political party. He epitomizes the golden rule of politics. He is loyal to his friends. In a day when some people’s word is no good, McGregor’s is solid as a rock. In politics and business your word is your bond, and that is why McGregor is revered and respected by the majority of Alabama’s political folks. If McGregor tells someone he is their friend and will support them, they know they can take it to the bank. There is a political maxim used by longtime political veterans who have been in the Legislature for years and have fought major battles over controversial issues – the type of battles where you have to get a good toehold and stakeout your position and stay put. Thus, the saying is analogous to being in a monumental battle where you get into a foxhole to survive. Therefore, if a politician says about another that he is someone I would want in my foxhole in a war they are talking about someone they would trust with their life. That saying has been used to describe McGregor on more than one occasion. Most people assume that Milton McGregor’s only interest is gaming. However, he is invested in the Nursing Home industry, the real estate business and farming. He has been successful in each of these endeavors. McGregor grew up in the Wiregrass. His family was very politically connected, so he got his love for politics honestly. 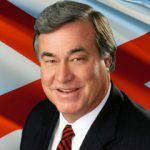 McGregor idolized his older brother, Tom, who was a political icon in the Wiregrass. Tom McGregor was instrumental in electing the legendary George Andrews to Congress. In fact, Tom McGregor got Andrews elected to Congress while he was still overseas in the Navy. Andrews was elected to Congress in the 1940’s and served in Congress more than 20 years, became a power and is the reason Fort Rucker is located in Ozark/Enterprise. The elder McGregor was Andrews’ right-hand man for more than 20 years. Milton McGregor loves politics, but he loves his wife of over 50 years, Pat, more than life. He is considered one of the most loyal family men in the state. Unlike many of his so-called religious and pious detractors, there has never been a hint of personal scandal around Milton McGregor. His generosity is unlimited. There are stories about his allowing politicians to ride in his luxury airplanes, and they have. The truth is he is doing it more out of friendship rather than for personal gain or favoritism. There are ten times more occasions where he has given free use of his planes with his pilots to shuttle an indigent cancer patient to a hospital to save their life. Milton reached the point financially, long ago, where he does not need any more money. He plays politics for the love of it. He has given more than $300 million to charities over the years. That is 300 million dollars more than the Indian casinos have given Alabamians. My mama always said that you can tell who a real gentleman is by the way he treats the person less fortunate. Milton McGregor epitomizes this quality. He treats the lowest janitor in his racetracks with the same sincerity, warmness and dignity that he does to the wealthiest people in America whom he rubs shoulders with every day.